Di Marcotullio L, Ferretti E, Greco A, De Smaele E, Po A, Sico MA, Alimandi M, Giannini G, Maroder M, Screpanti I, Gulino A.
Nat Cell Biol. 2006 Dec;8(12):1415-23. Epub 2006 Nov 19. ITCH polyclonal antibody ( Cat # PAB7215 ) ( 0.03 µg/ml ) staining of human brain ( frontal cortex ) lysate ( 35 µg protein in RIPA buffer ) . Primary incubation was 1 hour. Detected by chemiluminescence. 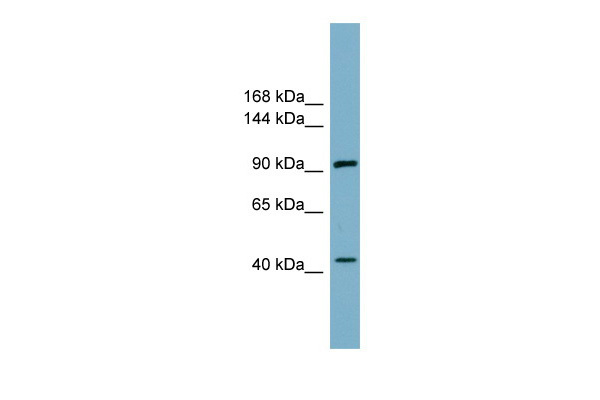 Western Blot analysis of ITCH expression in transfected 293T cell line (H00083737-T01) by ITCH MaxPab polyclonal antibody.Lane1:ITCH transfected lysate(94.82 KDa).Lane2:Non-transfected lysate. 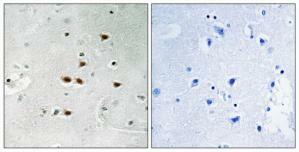 Immunohistochemistry analysis of paraffin-embedded human brain, using ITCH (Phospho-Tyr420) Antibody. The picture on the right is treated with the synthesized peptide. 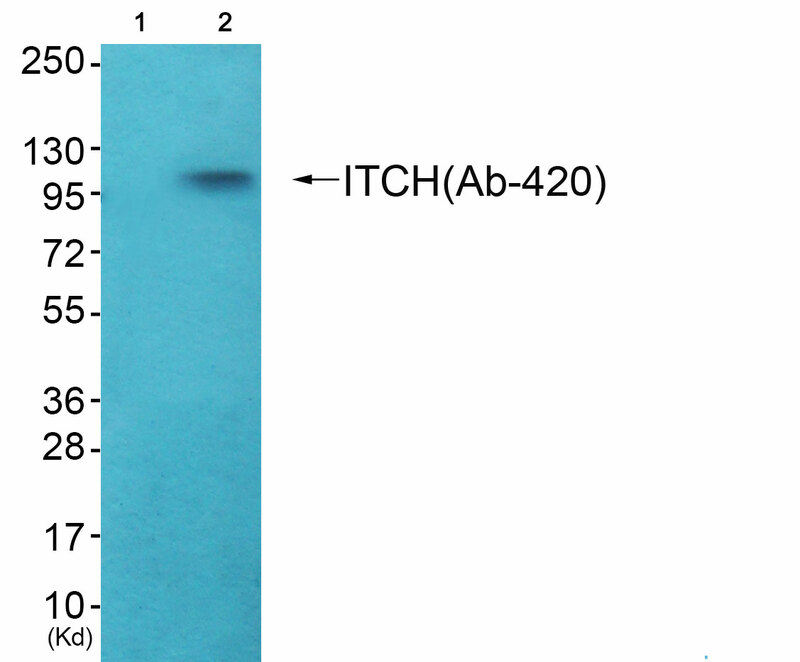 Western blot analysis of extracts from mouse brain cells, using ITCH (Ab-420) Antibody. The lane on the right is treated with the synthesized peptide. 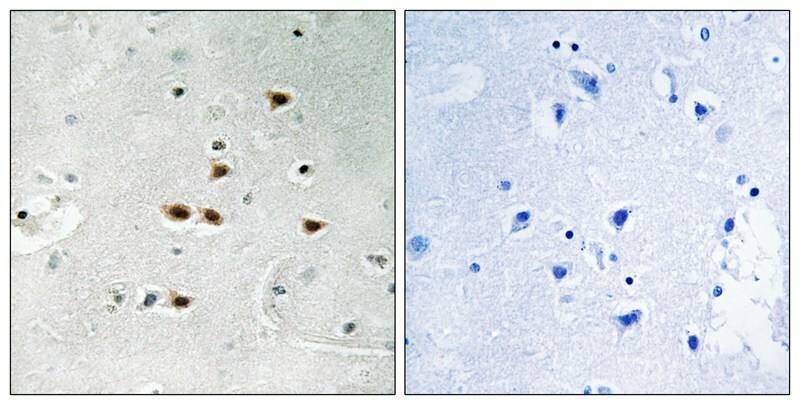 Immunohistochemical analysis of paraffin-embedded human brain tissue using ITCH (Phospho-Tyr420) antibody AP55793PU-N (left)or the same antibody preincubated with blocking peptide (right). TA302519 (0.03µg/ml) staining of Human Brain (Frontal Cortex) lysate (35µg protein in RIPA buffer). Primary incubation was 1 hour. Detected by chemiluminescence. Western blot analysis of extracts from mouse brain cells, using ITCH (Ab-420) antibody.The lane on the right is treated with the synthesized peptide. 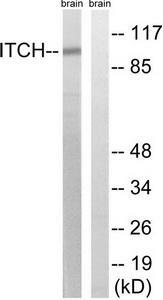 Western blot analysis of extracts from HepG2 cells (Lane 2), using ITCH (Ab-420) Antibody. The lane on the left is treated with systhesized peptide. 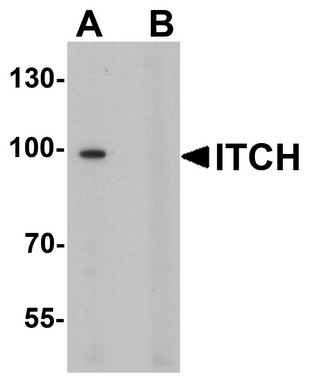 Western blot analysis of ITCH in 3T3 cell lysate with ITCH antibody at 1 ug/ml in (A) the absence and (B) the presence of blocking peptide. Immunohistochemistry analysis of paraffin-embedded human brain tissue using ITCH (Phospho-Tyr420) antibody.The picture on the right is treated with the synthesized peptide.